Where do I use my Enterprise Car Club voucher code? Start by searching a destination. You will then be displayed with the different plans available. Choose the plan that suits you best by clicking ‘Select this plan’. You will then be given payment options choose one by clicking ‘Select’. The next page you will be asked to fill out a form you can start this by clicking ‘Get Started’. On the right-hand side of the page, you can now enter your code click ‘Add Promo Code’ to reveal a box. Enter your code here and click apply. The Payment summary will be automatically updated with any discounts. Enterprise Car Club offers a more convenient way to travel. With car stations available everywhere, you can find the car, van, or other vehicles that you need; and conveniently ride away at pay-as-you-go rates. This removes the hassle of maintenance yet still allows you to enjoy a comfortable mode of transportation. With Enterprise Car Club your vehicle is just around the corner with 950 self-service vehicles in 19 UK cities, all available 24/7. You can search for your nationwide car hire with Enterprise Car Club in their location search on their website, which allows you to pinpoint the exact areas in cities where a vehicle is present. Locations with Enterprise Car Club include regions such as South East England, South West England, North East England, North West England, the Midlands, Scotland and Wales, so no matter where you are in the UK you can find the car hire nearby. Join now, reserve your car in your selected location, unlock and go, all for an affordable price. Then, when you're finished simply return your car and come back again when you next need handy vehicle hire. The cost of Enterprise Car Club doesn't need to be expensive, with affordable prices on all their vehicles and plenty of codes and promos available, you can snap up some affordable car hire wherever you are in the UK. 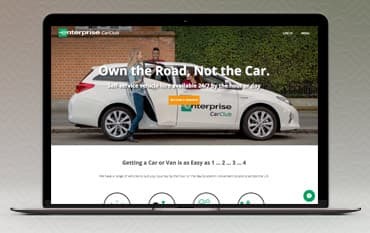 Join the Enterprise Car Club today, choose your vehicle and hire it for a low-cost price, before you purchase your car hire, make sure you check out our site where we have tonnes of voucher codes and deals for Enterprise Car Club all in one easy, hassle-free space. Whether you're hiring a car for personal reasons or for your business you can enjoy reduced prices, made even smaller when coupled with our voucher codes and offers available on the Enterprise Car Club deals page above. To save money on your vehicle hire with Enterprise Car Club head to us at NetVoucherCodes. Enterprise Car Club works directly with us to provide discounts and deals on many of their car hire options with a selection of great promo codes, e-vouchers, promotions and more. We keep all our promo codes for each retailer in one easy space, so you can grab a code quickly and easily to ensure you save money as soon as possible. For easy and hassle-free savings simply check out our Enterprise Car Club deals page above and find the perfect discount that suits your booking. If you can't find a code or deal that suits you, don't worry new promo codes for Enterprise Car Club are added regularly so you are sure to find a discount next time you buy. It's easy to become a member online at Enterprise Car Club. Simply complete the online application form and the Clubhouse team will then give you a call to finalise your application. You must be 19 years or over to join and must have had your driving license for a full year if you're under 22. Will I have access to all Enterprise Cars in the UK? As a member, you are allowed full access to the large network of cars available across 19 cities in the UK. This is a major perk of becoming a member! Simply Reserve your Enterprise Car Club vehicle and pick it up at your destination. Members have a wide variety of vehicles to choose from including small city cars, medium hatchbacks, electric vehicles, small vans, large vans and many more. However, if you're under the age of 22, you will only have access to small and medium category vehicles. Join Enterprise Car Club for quick and easy car hire in numerous locations across the UK. Membership prices start from just £6 a month and allow you to reserve a vehicle for your required date and time, then simply unlock and go. You can even hire your car by the hour or day and then simply return it once you're finished with it. City Car Club locations include regions all across the UK, so wherever you are you can grab affordable car hire, made even more affordable with our Enterprise Car Club voucher codes, promo codes and deals. To cut the cost of your Enterprise Car Club vehicle hire, make sure you head to us first at NetVoucherCodes.co.uk to grab a discount on your booking.